With the sun in Sagittarius (truth, justice, ethics) and the moon in Pisces (transcendence, sacrifice, and victim mentality) today and tomorrow are Five of Wands days. The Five of Wands always bring conflict and tension – but it’s not the kind we can directly address through positive action. The Five of Wands tension is more like a low-grade fever that – resistant to antibiotics – drags you so low you can nothing else but get just plain fed up. The reason is that on a Five of Wands day, we sense that not only is the whole of humanity not up to the challenge, but we – in particular – have been going about it all wrong. Actually it’s worse than that. 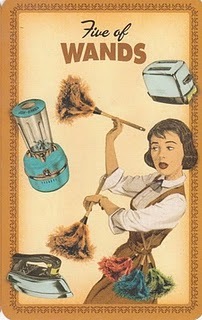 On a Five of Wands day, we realise that we’ve been lying to ourselves – despite heroic attempts to do otherwise. We’re all capable of self-deception, but on days like this, we’re downright confused whether the ‘voices’ we ‘hear’ are truthful or not. Although we’re desperate to be guided by our ‘higher Self’ – yet are thoroughly frustrated we can’t seem to get anywhere near it. When the moon shifts from Pisces into Aries late Tuesday morning (GMT), you’ll feel fighting fit again. Then you can look back over the experiences of today and tomorrow and see them for what they really are.